My first impression upon entering the Shanghai Jewish Museum during my abroad semester in China wasn’t much of an impression at all. The museum was powerfully underwhelming. A narrow walkway leads to a single courtyard with no more than a handful of small buildings to explore. The courtyard is surrounded on all sides by remnants of dilapidated living spaces, with one building that served as a place of worship, living, and education for a community of almost 30,000. I remember doubts rushing through my head, questioning whether there would be enough to say about the museum for my group’s midterm presentation. On top of that, the only tour still running that day was in Hebrew, so nervous palpitations set in as I pictured myself struggling to comprehend and translate the information to my non-Jewish friends. Much of the tour focused on basic World War II and Holocaust history and the diasporic journey of surviving Jews. While the story is unfathomably tragic, it wasn’t presented in an especially captivating manner and, for me, it was nothing new. It was information available on Wikipedia or in any of the many prominent Holocaust memorial museums in New York City, Washington D.C., or, perhaps most notably, Yad Vashem in Jerusalem. All are examples of museums with more resources, staff, larger facilities, and more compelling messages to share. I found myself in an awkward state, yearning for something special or unique about the museum like one waits for the build up of a song to resolve. An individual exploration of the final and most prominent building gave me this resolution. The building was hardly more impressive than the rest. It hosted a modest collection of Judaica, and a single ark with a beautiful but worn Torah scroll. But the walls were intertwined with another perspective, Japanese occupation. While China today has a national reputation for xenophobia (something I found to be true only in official political policy but not in actual person to person interactions), the museum went out of its way to stress the significance, extent, and impact of Chinese cooperation with the displaced Jewish refugees. The Hongkou district, where the museum is located, was one of the poorest and most crowded regions of all of Shanghai. For the local people, conditions under Japanese occupation were extremely harsh; people often lived 10 to a room and struggled to survive. To an almost comically appalling degree, these conditions still constituted refuge for the 30,000 Jews living in Hongkou. They were veterans of a life of hardship, and shared their wisdom and survival strategies with the local Chinese. In exchange, the Chinese helped them find a sense of home in a foreign land. Quotes about this symbiotic relationship lined the walls of the museum, highlighting an unfortunate but powerful bond between the Jewish refugees and the local community. Remnants of this bond can still be seen in the family-run noodle shops just a block away that serve a unique blend of Chinese hotpot and Eastern-European Jewish stews. The fact that a Communist country, which officially outlaws religious worship, not only tolerates the museum’s presence but also promotes it as a tourist attraction is significant. 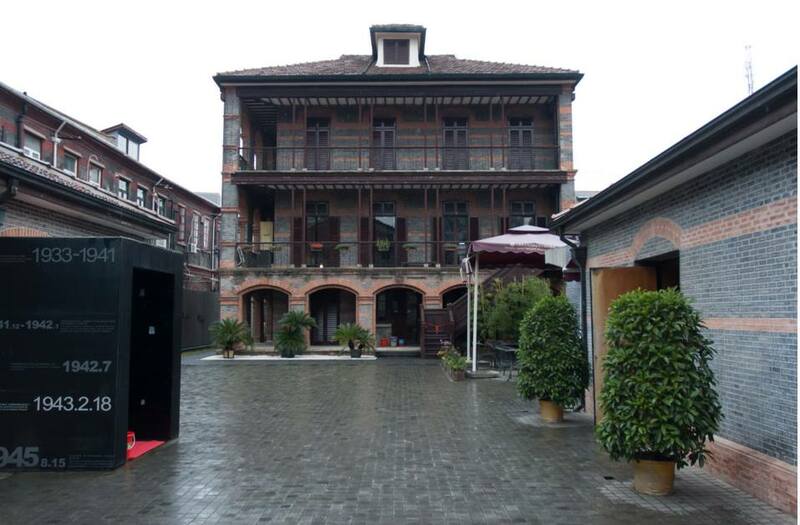 But more remarkable is the fact that the same dilapidated building, one that served as a house of worship for people who had miraculously not lost faith in their religion and culture, still holds services on High Holidays for Shanghai’s Jewish community. While the museum may not be much to look at, I took a great deal away from the experience. The idea that Shanghai, a place that, at the time, I called home, was already a home to my people in their darkest hour, is astonishing. It bolstered my appreciation for Chinese history, and reaffirmed the curious warmth with which I was met with numerous times throughout the semester. But most of all, it left me with a taste of cultural pride unlike any I had ever felt. The ability of one of the world’s smallest religious minorities to survive and thrive in foreign lands became much more than a story I had learned in school. It became real, tangible. It had a face; a Chinese face. And while on the architectural exterior that face wasn’t much of a sight to behold, underneath its decrepit, wrinkled exterior lies a story as tragic as it is heartwarming. A story of death, persecution, and the power of human collaboration in times of struggle. And that story, no matter how it’s shared, is beautiful.